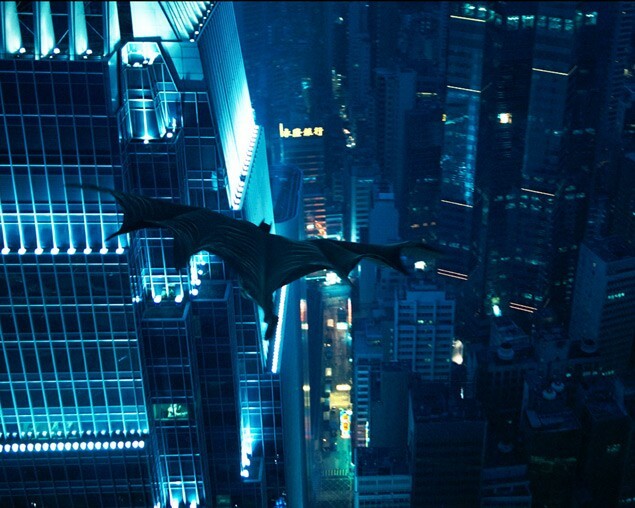 Given the fact that 2005's Batman Begins, writer-director Christopher Nolan's successful attempt to reinvent the flagging Bat-franchise (all but dead and buried after George Clooney and Arnold Schwarzenegger got through with it), ranks as one of the best superhero flicks ever made, then where does that put The Dark Knight, a sequel that manages to be even more phenomenal than its predecessor? Certainly, it places it somewhere at the head of the class, and there's a nice symmetry to its release date: After all, it was 30 years ago that the Christopher Reeve version of Superman -- still the greatest of all comic book adaptations -- was released, and now we have its equal on the other side of the aisle, a superhero saga that's as dark and deep as its forefather was cheery and colorful. That The Dark Knight prefers to exist in the shadows is no surprise to anyone who saw Batman Begins (and, really, why would anyone bother with this follow-up if they hadn't already caught the first film?). Nolan's initial exploration of the brooding hero owed as much to the helmer's previous pictures Memento and Insomnia (and his subsequent one, The Prestige) as it did to any comic book origins, neatly dovetailing significant events from the printed page with his own patented peek into the darkest recesses of the mind. Christian Bale, a talented thespian who makes humorlessness look less like a performer's choice and more like an established school of acting, was a logical choice to play millionaire Bruce Wayne and his masked alter ego, and the film moved outside its comfort zone of the fantasy milieu to comment on such real-world issues as the duality of man and the politics of fear (the movie's pointed references to Bush's United States of Terror Alerts were obviously lost on the right-wingers who sent me angry e-mails for daring to bring up the subject). Aside from a subplot involving the illegal wiretapping of the good folks of Gotham, The Dark Knight subdues much of its real-world topicality except in a general sense: Tweaking one of the major themes of the first film, it charts the eternal struggle between the good and evil that resides in most of us. Granted, this Jekyll-Hyde route serves as a common thesis in countless works of this nature, but The Dark Knight might be the first superhero movie that exudes a palpable sense of dread and menace that tugs at our nerves in a way that both disturbs and delights us. Even in superior entertainment like Spider-Man and Iron Man, there's a feeling that it's all make-believe; very rarely do the scenes venture outside of good-natured, goodhearted, Wham! Pow! Bam! territory. The Dark Knight offers no such safety net. All too often, it feels like Batman isn't fighting for the soul of Gotham City as much as Nolan is fighting for the soul of the superhero flick, a subgenre that paradoxically stands to be looked down upon even more by the mere fact that every filmmaker and his grandmother now seems to have a super-saga in the pipelines. The genre's newfound popularity might be its undoing (think of too many cooks spoiling the broth), yet here's Nolan fighting the good fight by offering a unique motion picture that can't easily be lumped in with all of the others. It wears its danger on its sleeve. In this outing, Batman and his ally in the police department, Lt. Jim Gordon (Gary Oldman, like many others a returning cast member), have done a fine job of tightening the reins around the mob bosses who have long controlled Gotham City. They're aided in their efforts by a newcomer to the scene: Harvey Dent (Aaron Eckhart), an idealistic district attorney who refuses to be intimidated by thugs and who's already being championed as the one man who can save the city from its criminal elements. Batman/Bruce Wayne initially has his doubts -- and his jealousies, as Dent's dating his longtime love Rachel Dawes (Maggie Gyllenhaal, thankfully replacing Batman Begins' Katie Holmes in the role) -- but he soon realizes that the d.a. 's intentions are indeed noble and on the level. But their combined attempts to corral the city's crooks are hampered by the presence of The Joker (Heath Ledger), a psychopath who, unlike most criminals, isn't interested in the payoff (money and power hold no appeal to him) as much as he's interested in the pursuit of the payoff ("Do I look like a guy with a plan?" he asks at one point). The Joker's lack of a master scheme is what makes him an especially potent villain; Bruce's faithful butler Alfred (Michael Caine) sums up the mindset of such men by declaring how some people commit evil just because they "want to watch the world burn." But The Joker doesn't just want to commit evil: He wants to build it from the ground up, and to demonstrate how even the most honorable among us can be brought down to the level of monsters and madmen, he sets his sights on perpetual do-gooder Harvey Dent. Developing the story with Batman Begins co-writer David S. Goyer and penning the script with his brother Jonathan Nolan, Christopher Nolan has crafted a near-masterpiece with this stunning motion picture. The deadly pas de deux between Batman and The Joker is compelling enough, but adding the character of Harvey Dent to the mix not only provides it with greater depth but also allows for further character entanglement once Two-Face gets thrown into the mix. (For those of you who don't know the story behind Two-Face -- all five of you -- I won't blow it here.) And lest we worry about getting overwhelmed by the nihilism of the piece or the blurry ambiguity of the central figures, we can always count on the squeaky-clean trio of Lt. Gordon, Alfred and Wayne Enterprises CEO Lucius Fox (Morgan Freeman) to employ their moral compasses to help anchor the narrative. Technically, the film is as bleakly beautiful as one might expect, thanks largely to the camerawork by Wally Pfister (who earned a Best Cinematography Oscar nomination for his efforts on Batman Begins). Except for a rolling, exploding helicopter that looks as it was programmed onto the screen by a computer, the visual effects are likewise excellent, and the theme by composers James Newton Howard and Hans Zimmer offers the usual flourishes found on a superhero-flick soundtrack but embellishes them with a somber underscore that nicely suits the overall mood. As for the cast, Eckhart stands out in what proves to be the picture's most fully realized characterization. Still, we all know who's the MVP of this particular show. Even if he hadn't tragically died this past January, Ledger would have been the talk of the town -- any town -- for his remarkable turn as The Joker. Deprived of a back story (though he invents a couple for the "amusement" of potential victims) and thus denied any possibility for even an ounce of audience sympathy, this lunatic is a whirling dervish of cackling, lip-smacking, cheek-sucking sin. Ledger makes the character as scary as possible, and when -- make that if -- we laugh at the manner in which he, say, slicks back his hair as he prepares to tangle with Rachel or performs a magic trick by making a pencil disappear (in gruesome fashion), we're not laughing at him or even with him. Instead, it's a laugh of sweaty unease, an involuntary chuckle designed to convince the character that we're as cracked as he is, lest he leap from the screen in disapproval and practice his chaos theory on us. Ledger's work is so mesmerizing that he has us believing The Joker could indeed penetrate that fourth wall. Now that's a great performance.